The crisis determined companies to decrease their budgets for medical services offered to their employees. The Client wants to increase the value of the turnover generated by individuals and also the turnover for several medical services, where they have an competitive advantage. The running costs with the call center to be at a lower level, the site being able to grant more online service requests than request by phone and be a better information source. 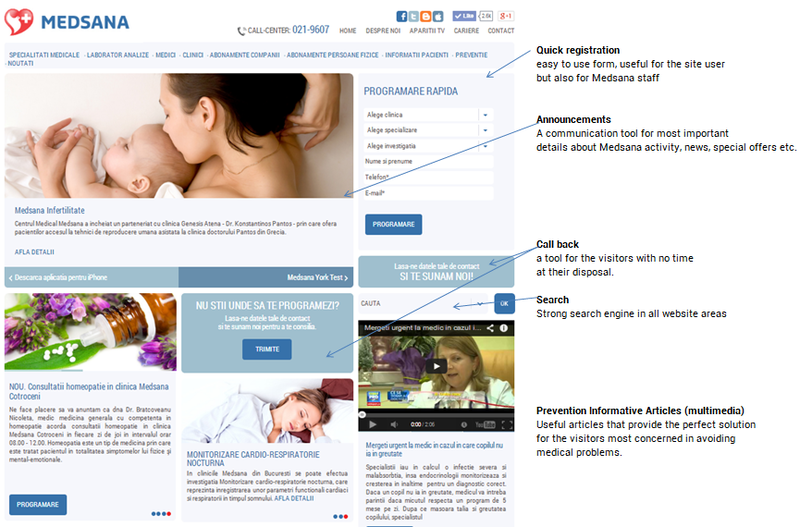 Medsana is one of our oldest clients, having a collaboration for almost 10 years. We developed all their site versions until now and the assigned Project Manager became a specialist in Medical Online Communication. We set the goals we want to achieve: increase in number of services requests; increase in traffic due to SEO friendly web-site; decrease of call center work hours. We propose an efficient conversion architecture (wire frame for the home page and the interior pages: menus, site structure, the appropriate conversion functionality (forms, quotes etc. ), establishing sales funnels. All features of the web application was documented in the “Analysis document”. Our client desired fast, quality web experience on any browser, device, technology or network they could used. Based on the analysis documents agreed, using cutting-edge technology we perform: database design, back-end and front-end features. Our developers know the importance of: using the latest PHP an MySQL versions, clean code development, modular code development, OOP programming, agile methodology. We successfully delivered the proper customized solution for an advanced e-commerce store. Medsana is a clinic with a very large area of services, over 150 doctors and three major centers. The solution we delivered was client oriented, the user to have the easiest way to register for a medical service, for any type of client: usual client, that knows very well the Medsana offer, clients who look for a specific doctor or clients who just have a problem and they need to be guided to the proper medical service. Quick registration: for the client is the easiest way to register, a few fields to complete and that’s all, we got all we needed for Medsana system to allocate the registration to the proper department and doctor. Announcements: the most important area of the homepage for delivering important messages to clients. 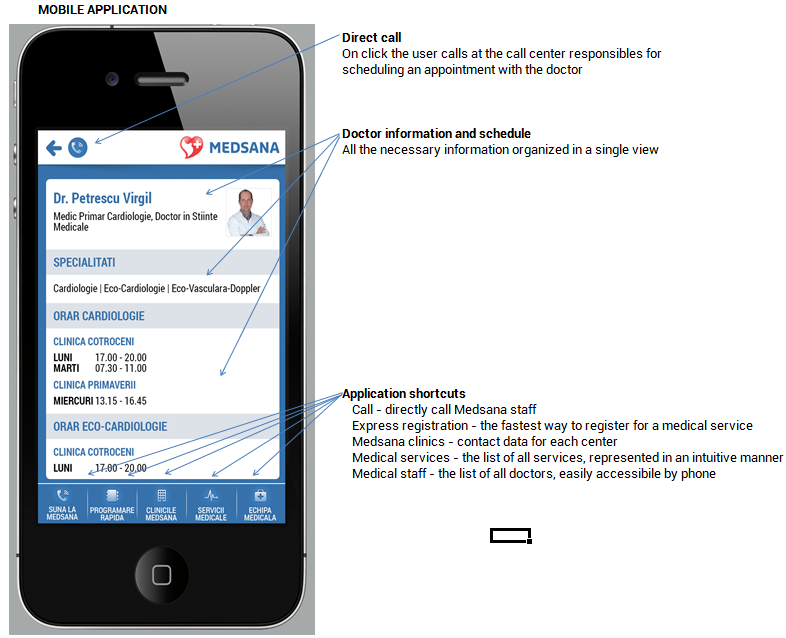 Medsana is very active with their activity so they needed a highly flexible communication tool using any kind of media: text, pictures, video’s, embedded codes from other sites etc. Call back: built also for the ease of use for customers, this system is designed for the users not so familiar with internet or who just don’t know what medical service to request. They only send their phone and Medsana takes care of everything regarding the registration. Our registrations management system helps a lot for this activity, allowing the client to send the telephone number and to be contacted. Search: a strong search engine tool for the website, returns any kind of information (medical services, doctors list, useful articles etc). Prevention information area: a highly important area for getting visitors back or bringing new potential clients who are interested in this kind of programs. Through this area we easily guide users to the subscription list or medical services list, where they can easily choose the services they need. Help on registration: the visitors that need guidance only have to complete a form and depending on their need they will be redirected to right medical staff to advice. 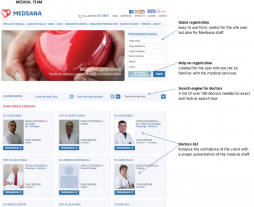 Doctor’s list: Medsana has over 150 active doctors. The site needs an intuitive search tool. 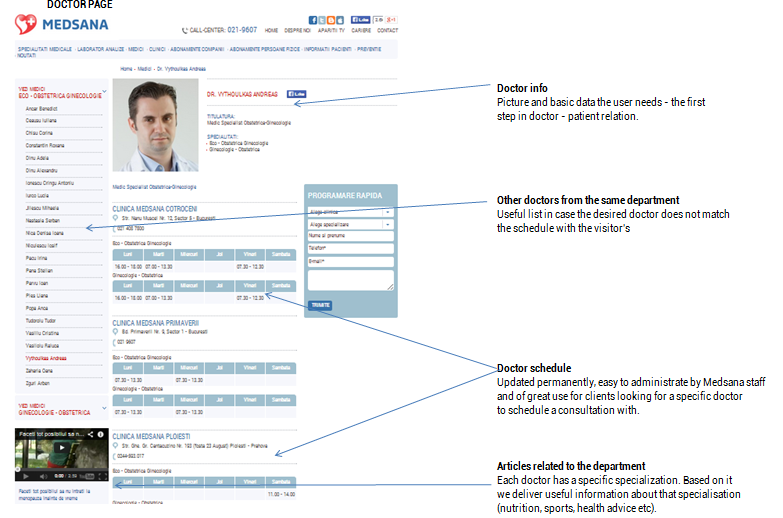 In no more than a few seconds the visitor is at a click distance to finding all the details the about the doctor he / she is interested to schedule a medical service. Many clients are first interested about a specific doctor. 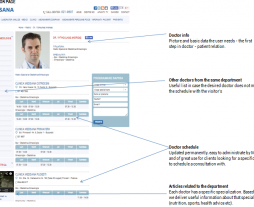 We created individual pages for each doctor where a client cand find out the general details about the doctor, the medical services he/she is specialized in, the schedule of the doctor. An online registration form is sent for this specific doctor. We also displayed the rest of the doctors of the same medical specialization. This way, in none of the cases a site user will be stuck if he doesn’t find the information suitable for his schedule. An area of useful articles about this medical specialization is at the site user disposal, information being the key to taking the proper decision. Over 30% of the site visitors meaning an average 10.000 visits per month use mobile devices. So we developed a mobile application to provide the best navigation experiences for this type of visits.